Perhaps it shows me to be of a certain age. 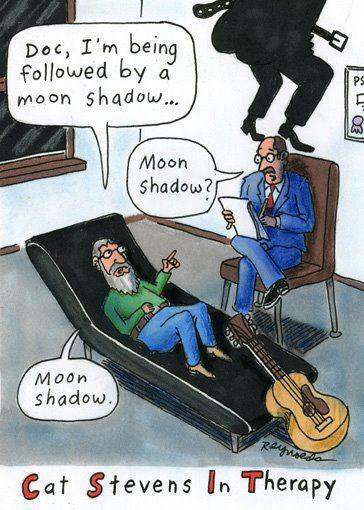 But I have to admit that the first thing that came to mind on seeing today’s three words is of course Cat Stevens’ immortal song Moon Shadow. To me this song, by this artist is as perfect a take on these three words as any I could ever hope to produce. And yet, here I am trying. It does seem to me, that while NaNoWriMo may help me to improve my final score (the last I checked I had blogged on 78.6% of the days in 2012. I am hoping to raise that into the mid-eighty percents by the end of the year, just because I will be more comfortable having achieved a solid B in my goal. Even though one of the biggest lessons I will take away from the ‘blog every day in 2012′ experiment is that publishing a new post every day is not in most bloggers’ best interest. While it is possible that you will build a fan base that is both large enough and insatiable enough to follow your daily posts, in most cases you will end up with more readers, more visibility and more impact by publishing less frequently than once a day. I also think that a collaborative blog could be really successful. Three or four bloggers alternating days might be able to create a very compelling site, although it could be very stressful I think, if the collaborators had different priorities and different levels of commitment to the project. Part of me thinks that it is just ‘negative thinking’ to speculate about such problems….when I am speaking only theoretically and am not in fact planning any collaborative project as I describe. (The part of me that has been dealing with people online for years knows how difficult it can be to bet a hobbyist writer to meet any deadline, and one that recurred once or twice each week…..well let’s just say that there are a lot of folks out there who would never keep up with that level of commitment, however enthusiastically they might embrace it going in. In my own personal experience, collaborating on a blog was much better in theory than in practice. I do seem to be in a mood to write more. I published a second piece in just a few days on my largely ignored politics blog. I also re-published that new piece on Broowaha, a citizen journalism newspaper that I sometimes contribute to. I don’t ever expect that I will be a top contributor on Broowaha, but in most cases the pieces I publish there get a great many more page views than I am mostly ever able to achieve on this blog. And one nice thing about that site is that I have inserted my own AdSense code and I do receive paid AdSense page views and rewards for ad clicks on those pieces. I’ve mentioned before that I am just one of zillions of web publishers who worked for years before ever realizing that what I was doing would probably never accumulate the 100 dollars in earnings Google requires you to accrue before they will deign to cut a check. But if your articles can fit into any of the newspaper’s categories, it is not a bad place to seed some articles and earn a few pennies for your work. And finally today, my thanks to Kamal Bennani who suggested today’s words. A bat flower– from The Goth Garden Guide on The Everyday Goth blog. Goth saved me. When I first contemplated today’s words I had assumed I would have to begin by associating bats with the phrase ‘bats in the belfry’. I was less than thrilled, trying to figure out if that rather old-fashioned phrase should be construed as meaning stone, cold crazy or just a bit batty. However when I did the image search I was amazed to come across several pictures of “bat flowers”, including the one at right in scary solid black. This flower does bear a striking resemblance to a bat, and the twelve long thorns protruding in front definitely have a….spooky effect in my opinion. I suspect coming across that flower unexpectedly in the light of the moon would frighten more than a few people. I have been slacking for several days in my blogging and social networking activity. It did finally catch up with my Empire Avenue share price– which dipped about ten cents yesterday morning. No big thing. I found myself realizing today that I really am doing this blogging and social networking just for fun, and if some days the most fun idea seems to be not to bother with it, that’s okay. I tend to think that having fun with it whenever you do it is the surest way to last for years and years and not just burn out. I am also realizing that when you are not feeling great it is better to go ahead and write a post that talks about not feeling so great, rather than trying to wait until you feel better to post. I realize that these two thoughts are somewhat contradictory. What can I say, I’m a Gemini. Here’s hoping that it’s been a great week in your world, and as always I would be eternally grateful if you could leave me just three words as a comment. Please, not the keywords for your blog or some three word phrase. Just three (random) words. I am so thrilled with all of the responses I received to my last couple of posts. I now have thirty drafts to work from, so am not feeling any urgency about it. Yet I can’t resist continuing to ask for more. September definitely seems like the time to get back to business. I am continuing to go through my shareholders list and follow folks on Twitter. I’ve been pleased that I am getting followed back fairly quickly. Who knows how long it may take to get back to where I’d been on my old account, but progress is always nice. Yesterday Ron and I treated ourselves to Popeye’s. Their shrimp po boys– while not exactly like what you would get in New Orleans– are absolutely scrumptious and the fried chicken is so, so good. Short of actually travelling to the Crescent City to eat for a week, Popeye’s is definitely one of this New Orleans boy’s favorite dinners. I have been surprised that my Empire Avenue share price continues to go up, up, up every single day. I am almost back up to 151/share, and if the trend continues I will soon be to a price higher than I was before I took some time off and had my fall. I am firmly resolved that this week I will begin working on revising Walking Down The Avenue. I am thinking that I am going to recommend that most players start out by accumulating wealth so as to be able to use Empire Avenue missions to guide social activity and build their followings across the various networks. Here’s hoping it’s been a nice Labor Day weekend in your world. And finally today, my thanks to Wayne Hurlbert who suggested today’s words. Get Out Of The Blog With Your Hands UP! Gay As Hell or Where’d My Audience Go? Soaring So High, Then CRASH! !